As an extension to our current practice, we developed the Portable Reading Room to act as a mobile project space, gallery and bookshop.? It was a flat-pack, easy-assembly enclosed structure incorporating seating, a layout area where books can be displayed and examined, storage space and, on the exterior surfaces, an area for displaying artwork, a notice board and signage. As well as being a site for activities the Portable Reading Room was a social sculpture in its own right, centered on the activity of reading and the book as an expressive medium. Readers were encouraged to interact with one another in an unfamiliar but welcoming space and, in a sense, put themselves ‘into’ the imprint. It could be incorporated into an exhibition, set up in public spaces such as museums, universities, theatre foyers and festivals and function as an exhibit within a gallery context. It complemented a broad range of events such as exhibitions, art fairs, artists’ book fairs, conferences, symposia, school and college curricula. On tour, The Portable Reading Room visited a range of venues to publicise and disseminate our imprint with new publications as a focus. In return, it offered a space for artists working with WPP and for local groups and individuals to devise and run their own activities based around ideas of reading, writing, publication and the integration of these into visual art. These collaborative activities offered a platform to a network of practitioners enabling audiences to become active participants. The portability of the project meant it could be shown in venues of any size, from a village hall to a city gallery, for periods of a day to one month. Its interactivity allowed the viewer/reader to become fully engrossed in the concept and the media. One of the main aims of this project was to break down boundaries between what are separately seen as “Literature”, “Writing” and “Art” and, by doing so, extend participants’ and their audiences’ understanding of what these forms can offer. 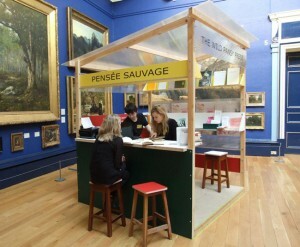 Contact us at wpp@leeds.ac.uk to find out more about the Portable Reading Room and the Wild Pansy Press.